March 28 is the anniversary of the death of James Thomas Brudenell (1868). “Cannon to right of them, Cannon to left of them, Cannon in front of them Volley’d and thunder’d; Storm’d at with shot and shell, Boldly they rode and well, Into the jaws of Death, Into the mouth of hell, Rode the six hundred” in…cardigans. Alfred Tennyson’s rousing retelling of the historic Charge of the Light Brigade is a poetic testament to the exploits of James Thomas Brudenell, the Seventh Earl of Cardigan, whose namesake knitwear unfortunately far surpasses his military legacy. Brudenell was born in Buckinghamshire, England, in 1797 and inherited his father’s earldom of Cardigan in Northamptonshire forty years later. Always an aristocrat, after entering the army, Brudenell capitalized on the then-ubiquitous British practice of selling military commissions to noblemen and purchased his own promotions to lieutenant, captain, major, and lieutenant-colonel in five short years. He was much loathed by superiors and subordinates alike—thwarted in an attempt to court martial one of his soldiers and deemed “unfit to command” by his senior officer—and was apparently no more charming in his personal life. He endured an unhappy marriage of twenty years before eventually separating from his wife and indulging a notorious affair while his wife was on her deathbed. 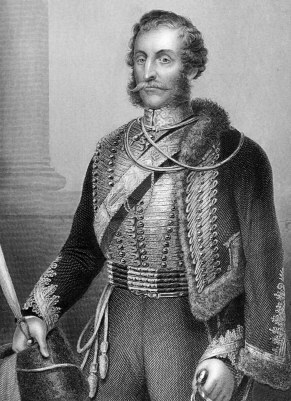 He eventually became a lieutenant general and in 1854 was placed in charge of the Light Cavalry Brigade during the Battle of Balaclava of the Crimean War. While a cavalcade of finger-pointing followed the attack, a small handful of details seem to be agreed upon. While English, French, and Turkish forces were trying to capture Russia’s primary naval base on the Black Sea and orders were given to retrieve several captured British guns, Brudenell’s 600 mounted troops were mistakenly directed (under protest) to charge blindly through Balaclava’s North Valley under the sweltering hellfire of Russian guns and marksmen. Upon heroically and inconceivably reaching the end of the valley and realizing a catastrophic error had been made, the brigade retreated back through heavy fire. Roughly 100 troops were killed, though Brudenell survived unscathed. Despite spending most of the war aboard his steam yacht in Balaclava harbor and failing to keep his troops properly supplied, Brudenell returned to England a hero, (self-) proclaiming his great valor. Subsequent reports eventually maintained that Brudenell might never actually have engaged the enemy, but the general never retracted his claims. He died after falling from a horse in 1868. What has since brought Brudenell sartorial infamy, however, is the stylish woolen vest he wore to protect himself from the bracing elements of the Russian winter in Crimea. Brudenell insisted that all of his officers be flamboyantly dressed, and he led the charge in splendid regalia. His knitted waistcoat was soon embraced by clothiers hoping to capitalize on his widespread popularity and eventually morphed into the collarless V-neck sweater embraced by such pacifists as children’s television luminary Mister (Fred) Rogers in modern times.